Jan Burkins and Kim Yaris had a great post last week outlining just what the Common Core ELA is talking about when it refers to research on text complexity. I think it could use a punchier summary that I'll try to provide here while still being accurate. Basically a company called MetaMetrics did two related studies, summarized here. The first looked at the complexity of texts used in post-secondary schools, workplace training, "citizenship" tasks like reading the instructions for tax forms, newspapers, etc. 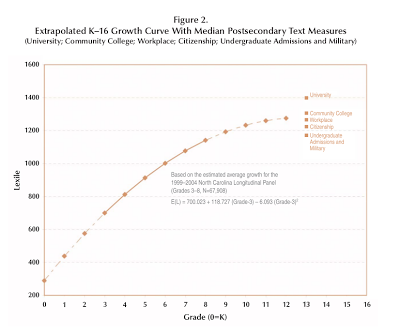 The second tracked the progress of reading scores in students in North Carolina between grades 3 and 8, to plot out essentially the standard growth curve. That's... pretty much it. That's your staircase of reading complexity. It isn't based on any particular ideas about what's developmentally appropriate at any point, other than as is implicitly expressed in this curve. What I don't understand is that this grade 3-8 curve is supposed to be based on what was actually observed under North Carolina's old standards in 1999-2004 (which Checker Finn and friends gave a B in 2000). 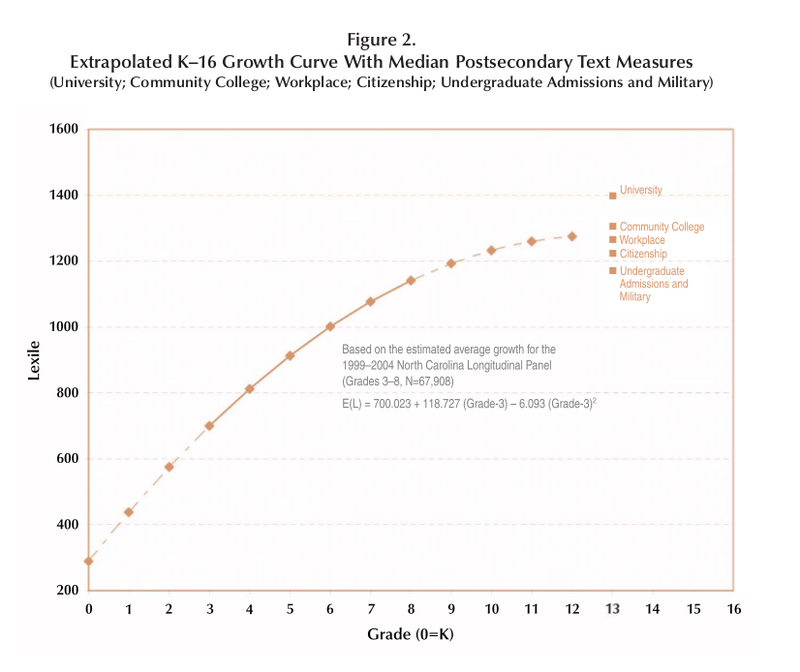 Nonetheless, the above curve is a bit more ambitious than the latest Common Core lexile recommendations would indicate. This just takes one back to "I have no idea what this argument is even supposed to be about." As a former high school English teacher, I'm not sure what to say about the relative flatness of the curve throughout high school, but it meshes with my overall impression of the Common Core, that it is very ambitious up through the end of middle school and then, relatively speaking, coasts.